In the 1980s, research carried out on the Otago Peninsula showed that, because the yellow-eyed penguin population had declined drastically due to severe predation and loss of habitat, it was now considered to be an endangered species. The unique penguin is found only along the eastern coastline of the South Island of New Zealand, as far north as Banks Peninsula and as far south as the Catlins, and on Stewart Island and beyond to the sub-Antarctic Auckland and Campbell Islands. So, in 1987, Dunedin conservationists formed the Yellow-eyed Penguin Trust with the aim of saving the penguin by restoring coastal forest and controlling predators. 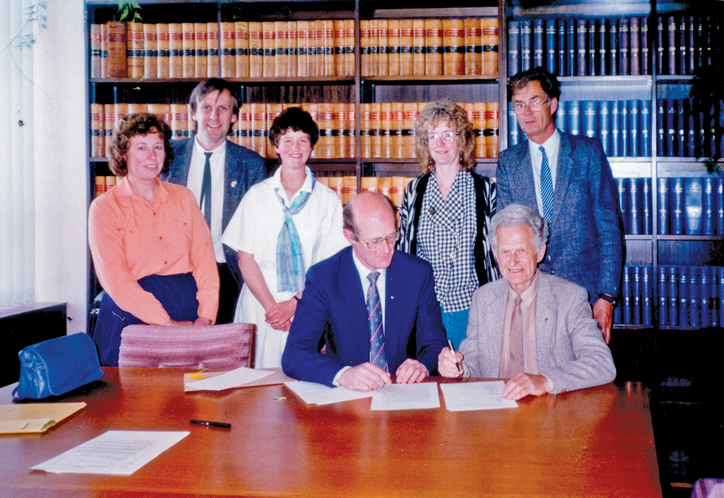 YEPT’s founding trustees signing the original constitution on 20th of October 1987. Left to right: Lyn Dowsett, Warren Hurley, Moira Parker, Christine Johnston and John Darby. Seated: the late Bill Armitage (Downie Stewart lawyer) and the late Paul Every. Absent: Lala Frazer and Euan Kennedy.